The choir audition was an afterthought. One of Hill Hall's pet pupils, she went off to be a Mezzo-Soprano...and left her heart on the farm. It can be the high point, the turning point or the low point in a college career: The Phone Call Home to the folks who have invested pieces of their hearts and maybe their savings in the fledgling's future. Got to be sensitive and tactful. 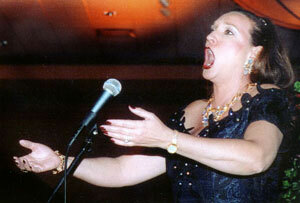 The aspiring opera star chooses her words economically. She speaks precisely, with sterling elocution. She is conscious of every syllable, every inflection. "Deddy, I ain't gon' be no lawyer. I'm gonna be a sanger." Terrific, Mr. Livengood must have thought. All the promise of a solid career in a respected profession tossed aside because some freshman adviser told her to take one more course and she could've taken anything but she went and did The Sound of Music for the choir director and now she's off on some lark. Where did we go wrong? 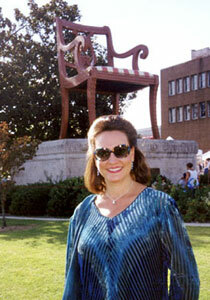 Vickie Livengood, '83, sanger, meet Victoria Livengood, the Dixie Diva. Hang on, Vickie. It's a long way to the top and we're taking the express. Voice, Acting, Italian, Russian, French, Spanish and Latin. Boston. New York: The Audition. Work hard, absorb, absorb. All the doors opening right in front of us. Seattle, Santiago, Charleston, Calgary, St. Louis, Salzburg, Cincinnati, Cologne, Atlanta, Edmonton, Carnegie Hall! A different city/country every month. Not on a lark, Dad, just singing like one. Basement of The Met just looks like the waiting room -- it's the stage door, Vickie, and how about helping me shove it open. Lola, Cherubino, Giulietta, Orlofsky, Maddalena, Preziosilla. "A house favorite!" Old alma mater wants us back home to receive an award. Honored. We'll be out of makeup in the wee hours and on the plane at dawn. Can we sing the national anthem at the football game? Always wanted to do that. It is 1991, and Vickie is all alone in Nice, France, on the eve of Victoria's European debut. She has taken a break in the middle of rehearsals for a Mozart opera -- a day off in Monte Carlo, and she's climbing all those steps to Princess Grace's castle. There's something tugging at her gut, and this time it's not just the farm in Davidson County and her family. Next morning she's rushed to the hospital, her appendix all but rupturing. "Mon Dieux. C'est Terrible," the doctors say. You talk about flying solo -- Victoria knows how to cry in six languages, but Vickie cannot talk them into sending her to the States. The phone line to the family is a million miles long. "I knew all the words for 'love' and 'flower'," she said, "but not 'pain' or 'bedpan'. All by my lonesome, I had an appendectomy." Then come the opera managers. In France, opera stars of Victoria's stature are treated as royalty, and the hospital is besieged by agents insisting that the show must go on. "Doctors and nurses filled my room, and I had to sing for them before I could go home," she said. "I sang the whole opera with my hand over my incision, and a doctor waiting in the wings." Stafford Wing understands just how alone Vickie was in that hospital, how strong the tether is between North Carolina and wherever. Wing taught her for a year at UNC and became her mentor. When she visits Chapel Hill, she stays with the Wings. "She is fiercely loyal to her family, her home state, her school," Wing said. "So many performers succeed, leave their roots behind and they become very unhappy -- even unhappy with their music as a result. She's kept what's really important, and one of the reasons she's so successful is she's so happy while she's working." Vickie’s father is a barbershop bass. Her mother sang four-part harmony in a Sweet Adeline quartet. Of their heirs, their son got the higher voice, Vickie the lower. "You know that old saying, 'Daddy sang bass, Momma sang tenor, me and little brother would join right in there?' It really was like that, " Vickie said. "In the car on vacations, my parents would start singing, and we would fill in whatever we heard missing in the chords." Then singing became the reason for the car trips, as the Livengoods of Thomasville started performing gospel music at churches and revival meetings. Vickie earned summer money singing in weddings. She took piano and dance but never had a voice lesson before coming to Carolina. Raised with a brother and all-boy cousins, she generally avoided heavy lifting on the family farm, staying close to the dance lessons and the Glamour magazines and dreams of being a beauty queen and the huge crush on Donny Osmond. She won high school talent shows mimicking Barbra Streisand. And she concedes that some cow calling may have helped develop her powerful mezzo. Once she tore off down her career path, Vickie was in demand back home, too. 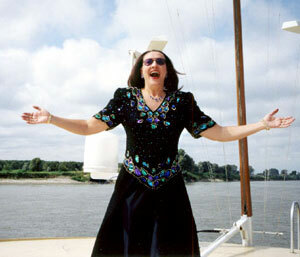 She sang at the community recitals and medical guild fund-raisers. She sang at the crowning of Miss Thomasville … and her brother married the beauty queen. 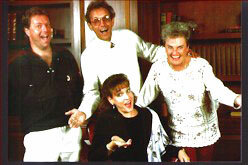 His wife took Vickie's place in the family quartet. "The neatest thing is, all the people in Thomasville have supported Vickie," her father said. “There's a tour guide in Thomasville who has organized trips to New York.” “My colleagues at the Met are just blown away by it,” Vickie said of the hometown support. "My dad has this unique 'call of the wild' -- he calls it 'calling the dogs.' I take bows in front of that curtain at the Metropolitan Opera, and my dad's calling the dogs. I believe I'm doing what God wanted me to do with my life. It's what allows me to leave my family and my husband at the airport crying." In November she gave her Met understudy a career break when she got special permission to come to Chapel Hill to receive the General Alumni Association's Distinguished Young Alumna Award. Victoria rocked Kenan Stadium with The Star-Spangled Banner, and Vickie cheered the football team, probably a little louder than the Met wanted her to. She got her arms around her whole family, and in the middle of a long New York winter during which she'll sing five operas, they mugged for photos and went to dinner. She had arrived. It's the departures she can't get used to. When Vickie came to Chapel Hill the first time, she'd been singing most of her life. "I just didn't know what I was doing." She was intent on Law school after graduation. That first semester, her adviser told her she needed one more credit. She thought tennis, maybe. "I'm very religious and I guess the Lord told me, 'sing--that'll be the easy A,' " she recalled. She figured most people auditioning for the choir would offer something more sophisticated than the theme from The Sound of Music. When Robert Porco heard Vickie's voice, it didn't matter what she was singing. Porco, who would become her theory teacher, soon had her vocalizing--matching pitches played on the piano. As he moved to his left on the keyboard, she entered uncharted territory. "I'd never sung low," she said. "He took me down to a real low register and I couldn't believe it." Porco, now chair of the choral department at Indiana University, said, "She had really quite a voice then, for such a young person." He described it as “a dark, rich, monstrous, operatic voice. “ Porco quickly gathered other members of the music faculty, and Hill Hall was alive with The Sound of Music once again. "It was a very fine voice, but it was rough," Wing said. "But she got turned on very quickly. It's a very exciting thing to realize you can express yourself vocally.” By her junior year Vickie was teaching voice in the music department -- unusual for an undergraduate. "She has not only the ability but the determination," Wing said. People poked fun at her in Boston because of her Southern accent. They soon took another look at her when she was the only one at the next rehearsal who had learned all her music. John Moriarty of the Boston Conservatory came to UNC to teach a master class, and he noticed Vickie. She was like a sponge, he told her, thirsting for whatever she could learn and adept at mimicking what she absorbed. He offered her a scholarship for her master's training. The doors had all opened in front of her so far, but still, Vickie wondered, after the accomplishments and the awards and the master's, what would she do with all this? The Metropolitan Opera auditions are a grueling ordeal consisting of seven or eight rounds before you ever even get to New York. There are only 10 winners per year. Moriarty suggested Vickie try to it immediately after finishing at the conservatory---just for fun. "I never entered with any intent of winning," she said. Apparently the judges didn't get the message. She won on the first try. Soon she had the right teachers, the best advice, an audience of opera managers and money to start her career. But no career. That's not one of the prizes. In 1990 Victoria put in her first time in the basement. That's the part of the Met where the covers, or understudies, go to wait, and wait. Prior to her debut she spent a lot of time there--and never once went on. She believes her break came, however, in being heard during basement rehearsals. "Because of my spiritual background, my faith, I always feel safe and protected and confident," she said. "I would like to think the standing ovation wasn't for me, Vickie from the farm, but for the power of the music." She made her first appearance on the Met stage in Verdi's Luisa Miller in 1991, prior to the European debut. Before this season, Victoria had leading roles at the Met in nearly a dozen operas and a long list of performances outside New York. By early December this season, she had done 25 scheduled performances and 10 more covers. As a mezzo-soprano, she's also done many of the "pants roles," playing the part of boys and men. And when she plays women, usually it's the, shall we say, less ladylike roles. "My dad asks why I always play the courtesans," she said. "It's because I------------------', lower -- that's the parts written for my voice range." Victoria has won the Rosa Ponselle International Vocal Competition and the Luciano Pavarotti International Vocal Competition. Opera News magazine has called her a star on the rise. Vickie will not let a publicity release go out without making sure it says she holds the key to the city of Thomasville. 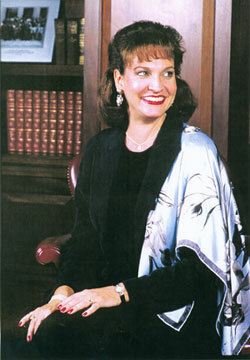 She has kept the home fires burning even in her music, performing music of the Durham composer Robert Ward with the N.C. Symphony in Carnegie Hall; singing her signature Carmen in Charlotte; making a triumphant return to UNC to open the 1994 William S. Newman Artists Series in 1994.Last fall she was the only mezzo-soprano invited to perform at a Lincoln Center tribute to the legendary mezzo Marilyn Horne. On a typical day this season, alone in New York, Victoria was doing a rare audition for a future stint with the Houston Opera Company; rehearsing several hours for the Met premiere of Britten's A Midsummer Night's Dream and being fitted for "an extravagantly beautiful costume, wonderful fabric from London;" working off the stress at the gym. And, as every day, dreaming about Carmen. She has seen the world. She has sung the world. She's got the key to the city. Donny Osmond called her on the phone. Dean Smith asked to have his picture taken with her. Luciano Pavarotti canceled his appearance in an opera at the Met last fall and when they scheduled another one in the spring, just for him, they asked Victoria Livengood to be in it and she turned it down because the role wasn't right for her voice. 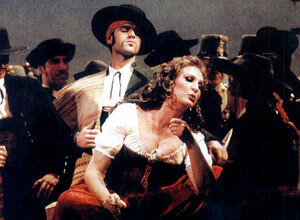 And she'd done Carmen -- opera's quintessential femme fatale -- a hundred times. But not, yet, at the Met. "There are several other gals out there making Carmen their bread-and-butter role. I'm hoping to get the cover on it in the next five years -- back to the basement -- and one night the phone'll ring and they'll know I did it a hundred times. And they'll say Victoria is a contender. All I want's the shot. I'll make the opportunity." Vickie’s husband was her high school sweetheart. His father was the Livengood's pastor. They went their own ways in college. When he heard about the Hill Hall recital two years ago, he made it known he would be there -- with four dozen roses, because he couldn't remember which was her favorite. After the concert they went for coffee. The couple recently celebrated their first wedding anniversary, with the whole family gathered at their home in Jacksonville, Florida, where her husband works. He's the attorney. After a few days in the city, a few rehearsals, the Southern accent will fade. But Victoria's friends at the Met still hear it regularly. They can tell when she's been home. Reprinted with permission from the Carolina Alumni Review magazine (Jan/Feb 1997).